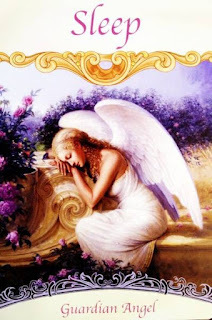 Card of the Day ~Sleep~ Take a look at the topic of sleep in answer to your question. Most likely, this is a message for you to get more rest. Cut unnecessary activities from your schedule and get a good night’s sleep. If emotional upsets are keeping you awake, give them to God and your angels. You can easily do this by mentally picturing your angel holding a bucket. Put any troubles into the bucket, and watch the angel take them away to Heaven, where everything is resolved. Make sure that your sleeping space is conducive to a good night’s rest, and check that your bedding is clean and hypoallergenic. Your increasing sensitivity means that you need to avoid chemicals or allergens in your bedroom; and it also needs to be dark, quiet, and cool. Fresh air can help you as well. This is also a message to take more time for rest during the day. You’re pushing yourself too hard. Avoid or cut down on stimulants such as caffeine, sugar, nicotine, and chocolate. Take frequent meditation breaks-even two minutes of closing your eyes, taking deep breaths, and holding positive thoughts will help. At night when I am laying in bed I visualize a white light coming through the top of my head and washing through my body, washing all the negative energy and experience of the day with it. Believe me it really helps you to relax and have a good night sleep. Have a fantastic day. I love you all!